1968 mini-skirted bride. Image from Wiki Commons. Despite the general crumbling of many institutions in the last 100 years, high divorce rates and a certain public cynicism toward idealistic notions of eternal love - by and large, it seems people still want to get married. 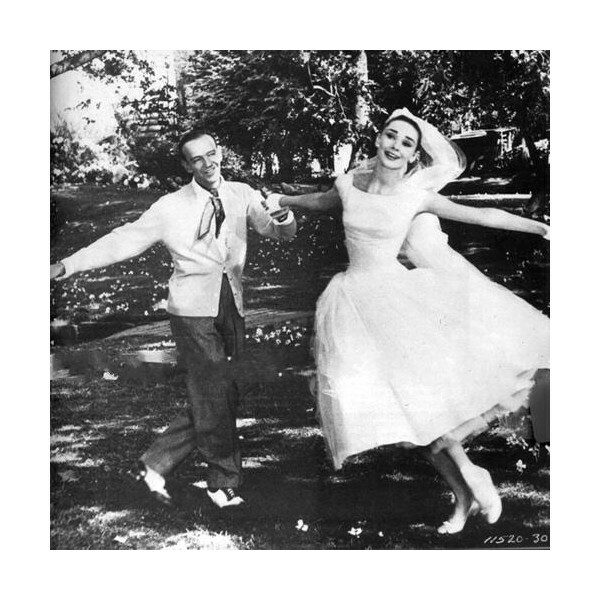 There's something about that public declaration of a private passion that stirs the romantic in us and perhaps the single most enduring theme of all the the frippery of a wedding day is the sentimental allure of the wedding dress. A single item of clothing that is generally worn only once in a lifetime, then carefully packed away in a box, to be retrieved now and then as a tangible and poignant reminder of an ever receding memory - of the idealism of youth and the promise of young love. 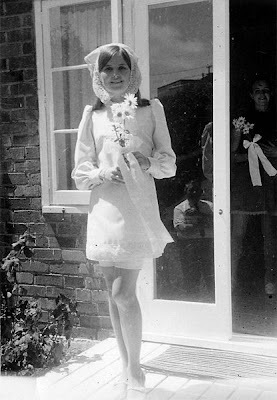 Although styles of wedding dresses change from decade to decade, one consistent theme of course, is the colour white, which remains the primary symbol of the wedding dress. In an age of sexual broadmindedness, serial monogamy and where the average girl has already lost her virtue by the time she leaves school, it's a reflection of our steadfast grip on tradition, that we have hung on to this icon of virginal purity. True, not everyone gets married in white, but enough do, that the bridal boutiques still feature a snowy spray of white froth in the front window. The association with the white wedding dress and virginal purity is really only a relatively modern concept. 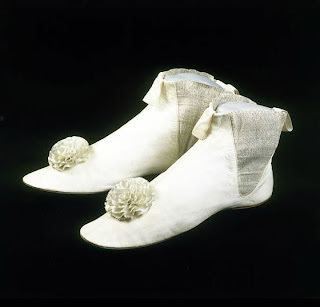 Prior to 1800, when it became common to wear white or cream, women were married in various colours, though always in their best finery as a wedding was a good excuse to display family wealth and status. Traditionally it was the colour blue, associated with the Virgin Mary, which symbolised virtue and purity. 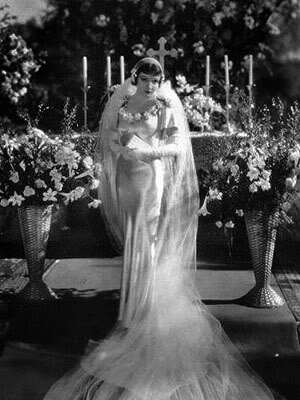 The concept of the white wedding dress as standard was further cemented when Queen Victoria walked down the aisle in a white dress in 1840. 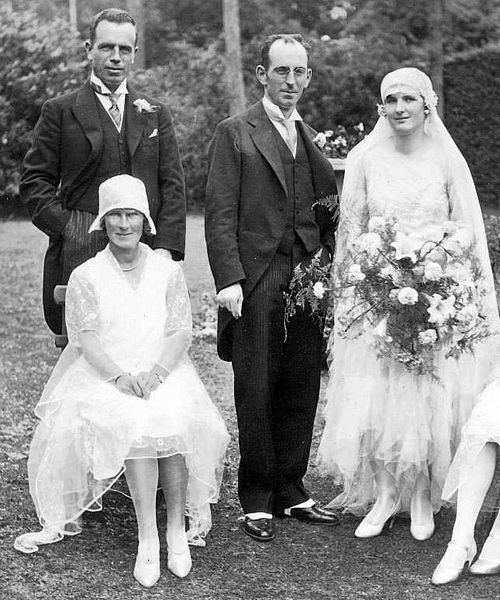 Oddly, until the 1930s, brides wore individualised wedding dresses, representative of the fashions of the day and there was no real generic wedding dress style. 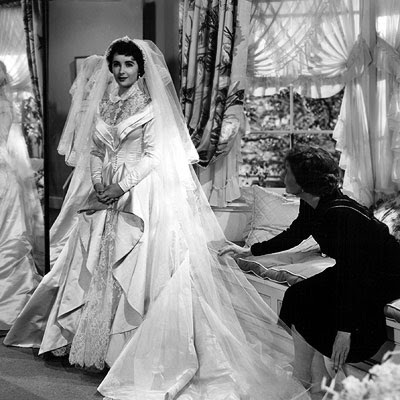 However from then on a kind of iconic wedding dress style formed in the public imagination - white and reminiscent of the long gowns of the Victorian era - and it has stuck there ever since. The infamous 'meringue' look is the one most often associated with weddings. Couture Allure, large variety of authentic vintage clothes, including wedding dresses. 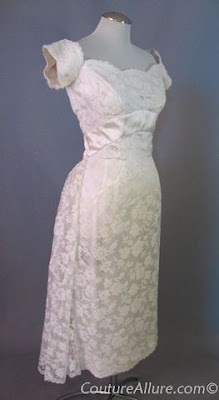 The Vintage Wedding Dress Company -lots of stunning designs. 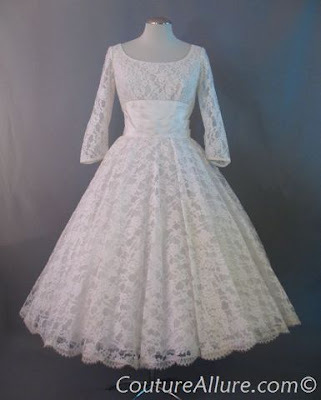 For those that have a treasured white wedding gown, the Victoria and Albert museum has a helpful section on caring for your dress and veil - here.